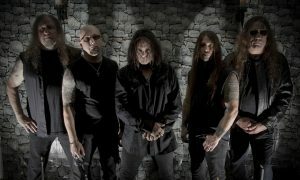 Legendary US Power Thrashers Hexx have inked a new two album record deal with Germany’s High Roller Records. The band is currently working on twelve new songs with producer Bart Gabriel (Crystal Viper, Burning Starr), who also produced band’s latest single ‘Tyrants Of Steel’ (part of their split with Ruthless). The new album will showcase the band’s return to their roots, and the style they are known for from their early classic albums ‘Under The Spell’ and ‘No Escape’. The album will be entitled ‘Wrath Of The Reaper’, and has been scheduled for the release in the Spring/Summer of 2017. Hexx, led by founding member and guitarist Dan Watson, features new vocalist Eddy Vega and Bob Wright (Brocas Helm) on second guitar. The lineup is completed by Mike Horn (who joined in 2013) on bass guitar, and drummer John Shaffer (who played in Hexx between 1986 and 1995, and returned in 2014). In addition to releasing the ‘Tyrants Of Steel’ single, in 2016 Hexx also reissued their early albums ‘Under The Spell’ and ‘No Escape’ in the form of a 30th anniversary 2CD/DVD box set via Metal Blade Records, and the 1991 technical epic ‘Morbid Reality’ via Dark Symphonies Records. Hexx originally formed in 1983 (previously known as Paradox) are acknowledged as one of the most original metal acts to hail from the 1980s San Francisco Bay Area thrash scene.